Scientists have suggested that there are possibly as many as eighty distinct sounds that a cat can make. These variations of "catspeak" include an array of meows, growls, hisses and screams. Perhaps the oddest, and yet most amusing, of the feline vocalizations is the one called "birding". Birding refers to the soft, rat-a-tat, machine-gun chirps that a cat makes when it is intensely watching a bird or similar "prey" object that it cannot get to. The strange sound is uniquely feline. Kitty may see a bird or squirrel outside the window. Or you may be playing with the cat using a feather on a teaser and you are holding it beyond the cat's reach. Perhaps you are having the cat's photo taken and the photographer is using a toy to catch the cat's attention. Whatever the circumstances, the common factor is that the cat wants something it can't get to—and makes a very peculiar noise. Despite its name, a cat does not have to be in the presence of a bird to exhibit birding behavior. The cat is totally focused on an object, usually a bird or a toy. 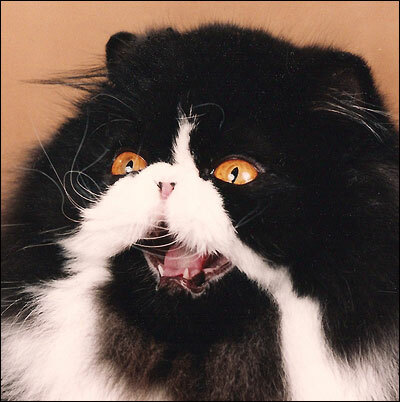 The cat holds its mouth slightly open. The whiskers are pointed forward and both the whiskers and "lips" or jaw vibrate rapidly as the sound is made. The sound is a series of soft chatters, or funny "eh-eh-eh" noises. Think of a quieter version of the sound Flipper, the dolphin, made when he wanted his trainer's attention. It may be an of expression of frustration. The cat sees something it wants badly but cannot get to so it makes these sounds to show how frustrated it is. It may be an expression of pure excitement. It may be a natural hunting instinct. It may be a cat's way of imitating bird sounds that are meant to lure the bird closer, so the cat can grab it. It may be an attempt to replicate the call of a insect, the bird's food source, again so the bird will come closer looking for a meal. Recent animal behaviorists have theorized that it is a "rehearsal behavior" in which the cat anticipates or practices the killing of prey, because the sound usually accompanies a biting movement similar to the one they use to kill their prey. Do All Cats Exhibit "Birding"? Not all cats exhibit "birding" behavior. It seems to be something that cats do more often in their "teenage" years when they are older kittens or young adults. Of course, some cats exhibit "birding" their entire lives. More Videos of Cats "Birding"